The entire potentially catastrophic crisis-cocktail described in the previous problem statement is created by the over-consumption of the elite and the upper-class. 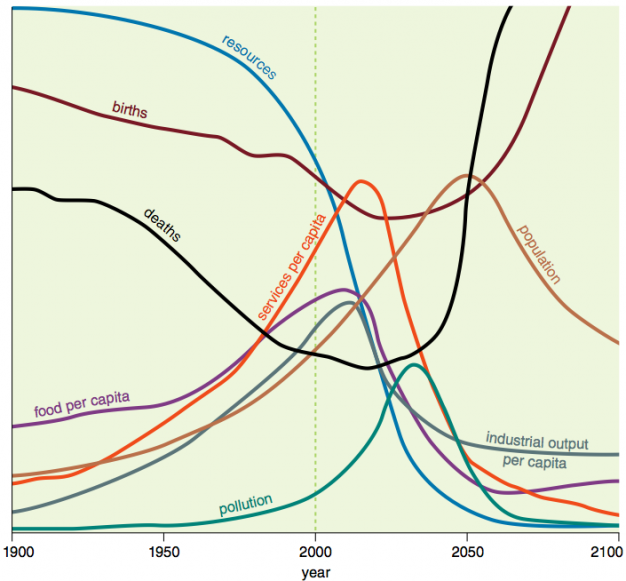 Yes, over-population is also a concern, but it comes in a distant second to per-capita over-consumption. The fundamental problem is that we are running out of planetary resources and causing massive environmental damages and, as shown below, the top 10% of the population is responsible for fully 60% of this problem. If we could magically remove this 10% from the face of the earth, our planet would be able to sustainably provide for 4 billion additional people. 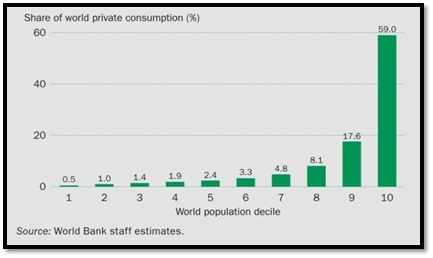 On the other hand, if everyone consumed like this top 10%, more than 6 billion people would have to disappear before we have a sustainable civilization. Unfortunately, the scary truth is that virtually every world citizen would like nothing better than to consume like the top 10%. And in chasing this horribly misguided goal, we have managed to create a consumerist society where consumption breeds more consumption. Because of the huge consumer demand of the top 10%, the economies of developed nations have slowly morphed away from production and towards consumption. 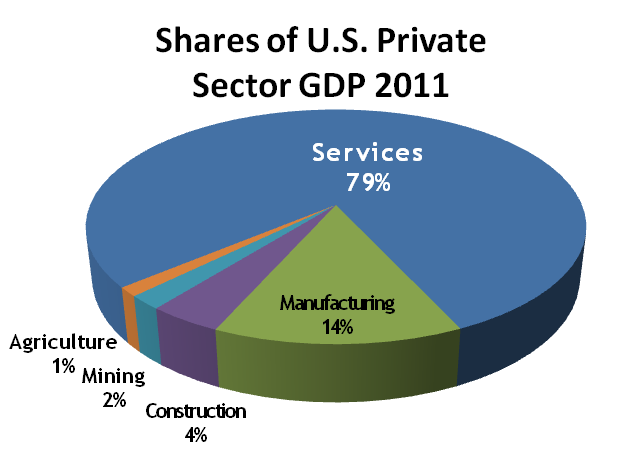 Most developed economies nowadays generate about 70% of their GDP from the service sector which is essentially jobs specifically aimed at granting the top 10% easy consumption of the goods produced by developing nations. The more this top 10% consumes, the more such service-oriented jobs are created and the easier subsequent consumption becomes. This makes developed nations especially vulnerable to an economic downturn. As soon as consumption rates decrease in such a total consumer economy, millions of people lose their jobs. Governments generally try to prevent this by printing money, taking on even more debt and granting the middle class additional purchasing power through cheap credit, but as we have seen, this only results in economic disasters like the 2008 housing bubble (see video below). As a direct result, more and more individuals are falling into the hopeless situation of having massive debt and no job. But this is not even the most destructive effect of our consumer economy. The most destructive effect is that people are steadily losing their sense of personal liberty and personal responsibility. They completely and unthinkingly depend on government to provide for their retirement, cover their medical expenses, maintain their consumption habits throughout the business cycle and take care of them when they lose their job. In addition, they completely and unthinkingly depend on our profit-at-any-cost consumer economy for basics like food, water and electricity. The effect of the total dependence on government is that people will be completely crushed when the system collapses and these promises made by our insolvent governments go up in smoke. And the effect of the total dependence on our consumer economy is that people get their sustenance from sources geared purely towards profit and not concerned at all with wellness and sustainability. Pensioners stand to lose the most from our total dependence on government promises. Pension funds are mostly invested in government bonds (government debt) which is essentially a claim on the productive labor of future generations. If these future generations are unable to deliver on this claim (because of massive ecological overshoot and/or shifting age demographics), the government will have no more money to pay pensions. 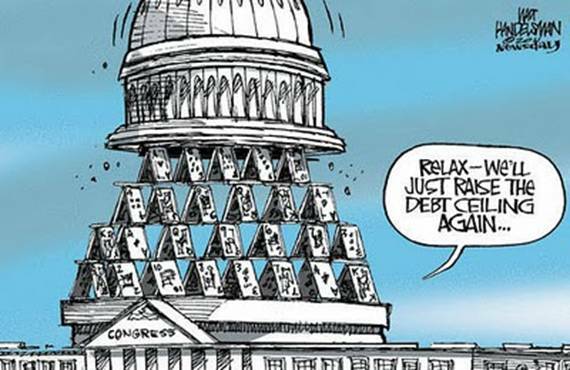 You can check the degree to which such promises have driven the USA to the stage of balance sheet insolvency (negative net assets) on the US National Debt Clock. The biggest of the numerous problems created by our total dependence on our consumer economy is the epidemic of obesity and degenerative disease that is currently upon us. 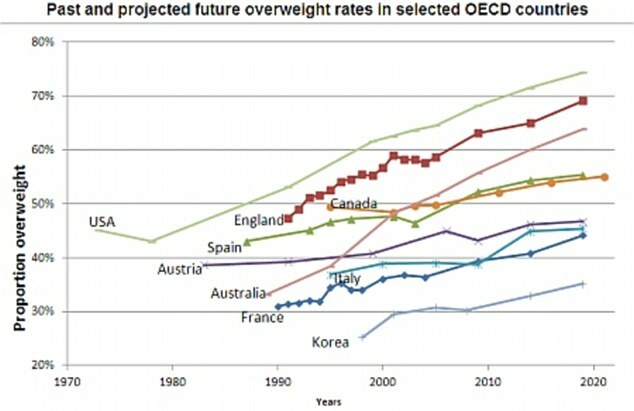 The richest billion spend more money on diet products than the poorest billion spend on food, but still obesity rates are rising rapidly across the world. The natural result is rapid increases in degenerative diseases like coronary heart disease and cancer which currently account for about 50% of all deaths in developed nations. Aside from the terrible pain and suffering they bring, these diseases also have massive economic ramifications. The poor health of developed nations is the primary factor bankrupting their governments. The US government, for example, currently pays 36% of its tax revenues directly back in the form of Medicare and Medicaid and this number is still increasing rapidly. In fact, the fewer than 5% of people that live in the USA consume almost 40% of global healthcare spending. Our childlike dependence on our broken systems is therefore not only ruining our personal health and financial security, it is also accelerating the continued degradation of these completely unsustainable systems. If we continue along these lines, a very painful collapse is a mathematical certainty. But aside from personal health and finances, there is one more somewhat abstract measure that we have to consider: life satisfaction (happiness). Even though things are now starting to come apart at the seams, our inflationary debt-based economy has led to incredible increases in the quality of life for citizens in developed nations while it was still running happily on cheap fossil fuels, abundant planetary resources, infinite waste storage capacity and rapidly growing, youthful workforces. The really sad thing, however, is that all of this amazing progress has granted us absolutely no increases in happiness. 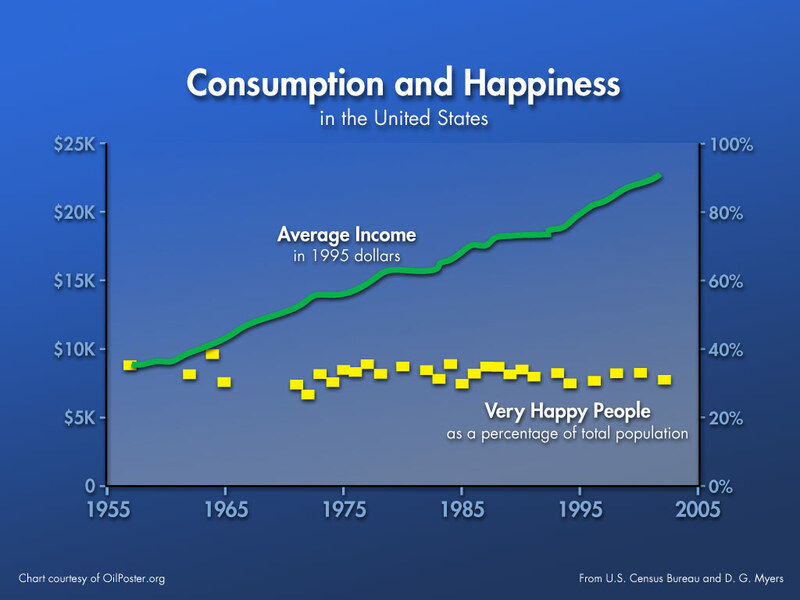 In fact, the number of Americans reporting themselves to be “very happy” has been slowly declining over the past few decades despite massive gains in material affluence. 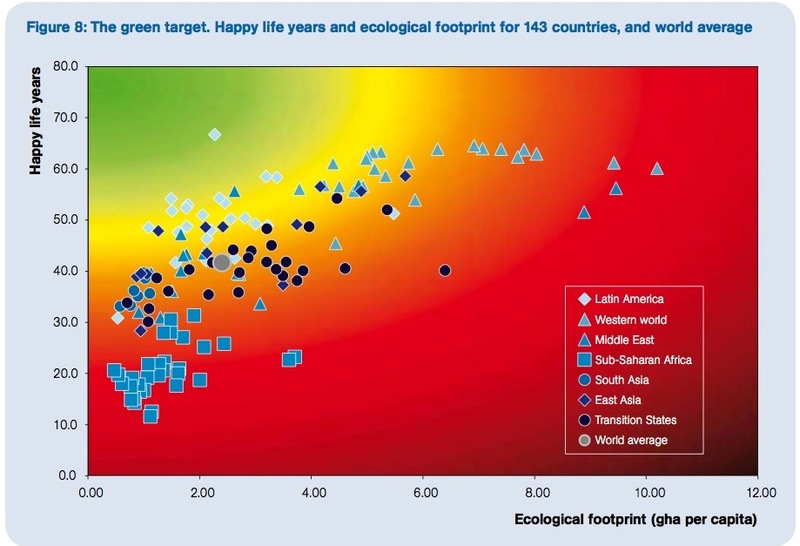 A very insightful trend on this topic can be established by plotting the number of happy life years (life expectancy multiplied by a life satisfaction score) against the average ecological footprint of various countries. Some very interesting work on this topic has been done by the developers of the Happy Planet Index and the basic trend (below) clearly shows that no additional happy years are gained beyond a certain, relatively modest level of consumption. Psychologists have looked at this phenomenon and have attributed it to our rapidly increasing material desires. They have simply confirmed the thing we all know within our hearts; as soon as we get one thing, we see ten other things that we want just as badly. The more we buy, the more we want, and the natural effect is that we can never be content and can never attain true happiness. All the wise sages throughout history have warned us about this, but we have simply ignored their warnings and kept on consuming at ever increasing rates. This truly has become a moral issue on a global scale. Our unsustainable consumption habits might be threatening our own quality of life, but this is nothing in comparison to the threats on the lives of the poor and future generations. If we do not mend our ways, people will die in great numbers as our environment degrades and resources dwindle. 250 000 people are already dying every year from the effects of climate change, but this number is set to explode exponentially as we continue our fundamentally doomed attempts to consume ourselves out of the current recession. The lives of billions of innocent poor people and billions of future human beings are in our hands. It is time that we, those lucky enough to have been born into the richest billion world citizens, start to take this massive responsibility seriously. You can start this process with a first look at the solutions. First a post to answer the question about what made me change my AGW view a couple of times. At first I was mildly sceptical of AGW on the basis that there had previously been worries in the 70s over an approaching ice age. My “instinct”, not really grounded in any science just stuff read in newspapers, was that it was probably just a similar media frenzy that would blow over. I stumbled into some discussions over the science on the net, and read them with interest. So my knowledge of the general debate grew a bit, and the guys arguing against the ones who were pretty sceptical of the science were clear, polite, articulate and very much dealt with the scientific points raised in a convincing manner. I asked some questions in areas I felt were grey, or that I was curious about and over the course of a 2-3 years, became reasonably sure that AGW was a problem and that we should probably be doing something about it. So at this point (which I think was probably around 2003-2004) you could say that the logical arguments against AGW began to improve. Where previously the AGW proponents could settle an argument by citing things from climate science papers, the debates shifted to discussing the actual papers themselves in detail. The classic example is the MBH98 paper – the hockey stick paper. It’s dreadful, in very obvious ways that can be understood by anyone capable of identifying cause and effect, yet it claimed to produce a reliable temperature history, showing unprecedented recent warming. When you realise that a paper like that was published by the cream of the climate science community, it really shakes your confidence in the science. Not only was the paper a disaster, but climate scientists proceeded to defend it against its very obvious failings, claiming that anyway it had been validated by many subsequent studies (which is simply the most unscientific defence ever). I was very suprised at that. So as the focus shifted to actually looking at the details of the papers, i’d ask questions at pro and anti sites, frequently taking the explanation from one site, asking for a response to that, etc going back and forth attempting to find an objective truth, ie a point in the argument where I felt with reasonable certainty that I understood the issue and could form an opinion on who was right. It was not always possible to form an opinion doing this but I think doing it gives you a good feel for what characters in the debate are reliable, and likely to give truthful objective responses. For example even though i’m sceptical of much of climate science, i’d never trust anything that Monckton wrote to be accurate. Others like McIntyre (climateaudit) and Liljegren (the blackboard) I find to be very dispassionate, cold in analysis, and almost always correct. So in reading back and forth on discussions of the actual papers, and asking back and forth when I was not clear over things, I came to the conclusion that in fact many climate science papers actually had significant flaws, that the climate scientists were very cynical in their responses to these criticisms, and in many cases could not adequately (in my opinion) defend the methods of their papers. In this way I became rather sceptical of AGW, ie felt the science was not solid and that it was being produced by advocates rather than dispassionate analysis. Thanks for that detailed reply. It is nice to see that you are a level-headed guy/girl without any ego involved. I had a short peek into the world of the online AGW debate and was just blinded by the arrogance and all the ego’s flying around from both sides. As a scientist I then just decided to keep my nose out of the little issues (that can get people arguing for years and come to no resolution) and trust in the findings of reputable organizations like NASA (http://climate.nasa.gov/keyIndicators/index.cfm#seaIce) and in the apparently overwhelming scientific consensus for AGW (http://en.wikipedia.org/wiki/Scientific_opinion_on_climate_change). From a large scale engineering point of view, the most destructive thing about this entire debate is the amount of energy that people invest on the tiniest little details and the almost inevitable end-result that the divide usually just increases after weeks of flame-wars. I see this entire debate as an incredible waste of time and resources to which it appears there will never be a clear resolution. But like I outlined in my previous reply, I think that taking steps to reduce CO2 will be in the long term interests of humanity regardless of whether AGW is fact or fiction. For example, in my field of expertise (CCS), the retrofitting of power plants with currently available (not yet optimized) technologies will raise the cost of electricity by about 30% (gradually over time) which would certainly not be catastrophic and only get people (households and industry) to think a little more about the energy they use. The amount of waste going on in our modern society is simply astounding and we seriously need to start thinking about what we consume. If CCS is allowed to be implemented (and rapidly further developed in the process), we can end up with an ultimate electricity cost rise of about 20% which will stimulate other energy saving innovation and get our civilization living much more sustainably (which would actually make our fossil fuel reserves last longer, giving us more time to develop renewables). Like all things related to AGW, the economic estimates of combating it (through carbon taxes etc) vary widely. For the US, sources fall between a cost of $100 and $1500 per family per year or, for the whole country, roughly between $10 billion and $150 billion per year. Now even if we work with the upper limit (which I think is a great over-estimate), this number is tiny in relation to things like American wars (costing the economy close to a trillion dollars per year), the self induced degenerative disease epidemic (which brings US healthcare costs up to about 2.4 trillion dollars) and the American tendency to blow economic bubbles (the housing bubble for example created a malinvestment of more than $4 trillion in the 20 million homes that stand empty today). Thus, for developed nations, the cost of fighting AGW are small and, in my view, very necessary to regain some perspective and to start living sustainably. But still, people moan on about the “billions of dollars” that will be lost. See this sensationalist headline for example: http://www.australianclimatemadness.com/2012/03/carbon-tax-cost-to-aussie-economy-30-billion-by-2018/. A $30 billion loss to the Australian economy over the next 6 years! Terrible! But what they neglect to say is that the Australian economy generates this in amount in a single week (of which there are more than 300 in six years). Wow… this post grew a lot longer than I originally planned, but I hope it conveys my point: the entire debate around the uncertainties of AGW should be irrelevant in developed nations for two primary reasons: we desperately need some deterrent to our totally out-of-control consumption (which is not making us any better off anyway) and the economic costs of doing this are relatively minor (especially considering the amount of time and money we waste fighting each other over this issue). Sorry got caught up writing more responses to Martin. Will comment tomorrow. Btw where does the 1.5 in “The really scary truth (shown below) is that we are already consuming like we had 1.5 planets” come from? Seems an incredibly bizarre/arbitrary number. This is estimated by the Footprint Network and they are very open about their methods. You can take a look here if you are interested: http://www.footprintnetwork.org/en/index.php/GFN/page/footprint_science_introduction/. The most important point to be mentioned is that about half of the footprint (which is the amount of global land area needed to sustain us) results from the area required to absorb our CO2 emissions. Therefore, if you believe that CO2 is completely irrelevant, the remaining global footprint (primarily cropland, forest land and grazing land) reduces to about three quarters of a planet which, even though still too close to the maximum, is sustainable. Your view on AGW will therefore also impact your view on ecological overshoot. 1) As far as I understand their pdf they do not account for absolute (rather than relative) yield efficiency growth, which historically has been huge and is continuing. If you think about a field in 1960 it was producing at 100% efficiency at that time and producing quantity X. These days it will be producing at 100% efficiency with quantity 2X. The graph hides the fact that in both 1960 and 2010 we were using 1 field at 100% efficiency. It effectively says we were using 1/2 a field in 1960 and are using a full field now, with the implication the field can not produce any more than the 100% it is producing now. 2) As you mentioned, even not taking into account absolute yield efficiency growth, it’s only really the carbon footprint that pushes us over the 1 planet line. 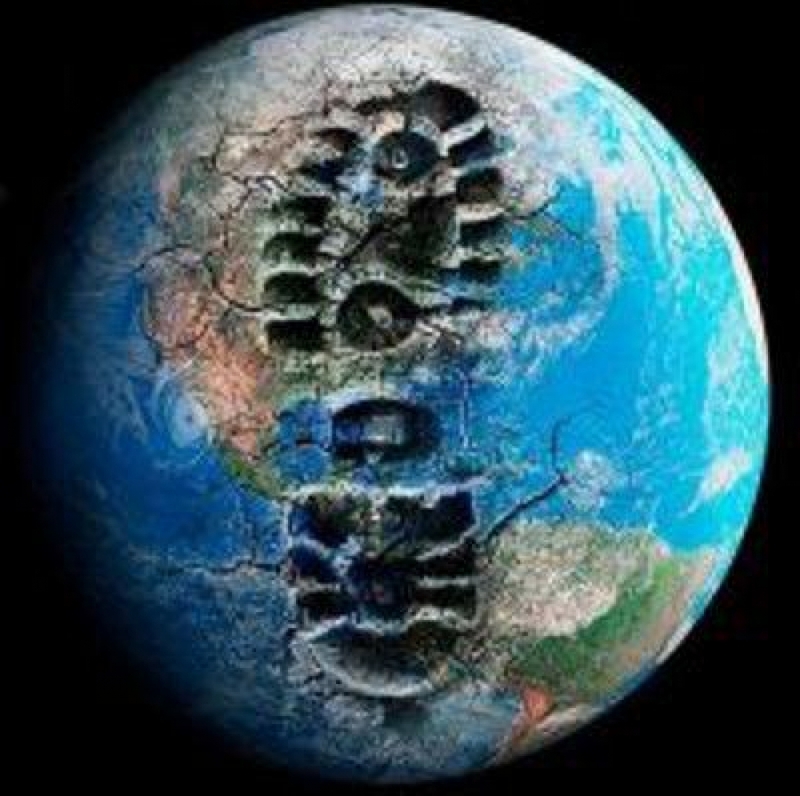 However the whole concept of their foot print is that its unsustainable. So human carbon emissions end up in the air, absorbed into the sea and absorbed into the land. But putting carbon dioxide into the air is NOT unsustainable in that sense because there is not actually a physical limit. And excluding the (i’ll claim its minor) effect on climate warming, at current levels there is very little difference that our increases in CO2 make, so there is not really a short term limit. Technological advances will take care of carbon emissions one way or another anyway, before they it ever become a problem. That is clearly wrong. They are not competing for the same biocapacity, it is both carbon sequestration and forest products at the same time. The wood produced for the “forest products” is largely composed of the sequestered carbon. Thanks for taking the time to go through their methodology. If you have the time and interest, I think it would be very interesting if you could direct your questions directly to them. I’m sure that a team of specialists who do this for a living would be able to explain their thinking in respect to the points you picked up from an hour or two of browsing over their work. If you decide to do so, please let me know what you learnt. 1) I too believe in the power of human innovation, but would like to caution against over-optimism. It is this natural over-optimism of the human race that has led to our current economic woes (which are far from over) and this same over-optimism can easily lead to much greater ecological woes. I think it is unlikely that the tremendous advances of the preceding 50 years will be repeated in the next 50 years. Back then we had all the cheap fossil fuels we could wish for and essentially a limitless planet. Now the game is very different and there are a lot more natural resistances to growth than there were 50 years ago. In addition, there are a number of factors (which, like AGW, are hotly debated) which can add further resistance to our ability to feed ourselves: health risks of GM crops, environmental impacts of fertilizers and pesticides, loss of fertile topsoils and peak oil to name a few. 2) Well, this entire point is based on whether AGW is a threat or not, so I will not say much more about that. What I do want to say, however, is that we should certainly not try to push the remaining footprint indicators up to the 1 planet mark for a number reasons: 1) We definitely should leave sufficient contingency for unforeseen events. 2) Even though the planet as a whole might be able to supply the needs of the population as a whole, distributing all of these increasingly scarce resources around the planet might become a problem especially if oil becomes scarce. 3) Using the entire planet’s biocapacity for human use is (in my view) very selfish and also potentially very dangerous by disrupting countless interconnected and self-sustaining natural systems. 4) We will have to revise our perpetual growth model at some time anyway – either now through intelligent pro-active action or have it forced upon us by scarcity and conflict later. 5) And of course, my favorite: many people and countries have proven that, beyond a certain (relatively low) point, increased per capita consumption grants no further increases in the number of happy life years a person can achieve. I was thinking of typical managed forest land. One time cutdown of natural forests is clearly a different matter. 1) Financially, I actually agree with you that there is a systematic problem. Many Western governments have been borrowing such substantial sums of money that I think there is going to be a problem paying back (without resorting to the printing presses). I would certainly not be lending my money to governments. 2) I disagree that the problem is consumption. Instead I think that the problem is these huge government spending pledges, funded by debt. The source of this problem is of course the electorate, who have been voting in these big spenders. I’ve come to the conclusion that this is a fundamental problem with democracy, that in essence as long as you get your hands on power you can spend what you want, and hence elections frequently turn into races about who makes the biggest spending pledges. Instead, if the voters who voted a party into power had to pay for the spending pledges of the parties they voted for, we’d see much more sensible governance. So the majority would still govern, but would not be able to magically issue debt for their spending, nor merely rob the ones who did not vote for them. 3) I think Hayek had a point that government spending to avoid recessions (particularly when paid for by debt) just makes the boom and bust cycles even bigger. Perhaps it would be less of a point if after a given recession subsided the spending was cut back again, but that never happens, instead the debt mountain just builds up. 4) Fossil fuels are not becoming scarcer. We are producing more than ever, and current reserves are larger than ever. 5) These global wealth pyramids really frustrate me. What is the point ? If Bill Gates started a company which became successful and he’s at the top of the pyramid with X billion… should he be relieved of it ? I don’t care if he has the “money” and realistically it’s not money anyway, it’s the value other people are essentially saying his business is worth. Is he supposed to give X% of his company to the poor of the world or what ? And it would be worthless to them anyway unless they actually sold it. Do you really care how much someone else has, and does that really affect us badly ? 6) “Over many decades therefore, it is only natural that the majority of assets have found their way into the hands of fewer and fewer individuals.” I think most of the really super rich are rich because they ran companies which on the global scene became outstandingly successful, and due to their share of the company (at its current valuation only I might add) they are extremely wealthy. If their company has a bad year, they can lose their wealth by 50% for example. Unless they are buying shares in their own company, the wealth is actually not concentrating in the hands of the top share holders. More usually actually they are selling, meaning other people are getting more of the assets. One thing I would say is that it’s much harder to become moderately wealthy through hard work and saving because the governments take so much of it through tax. The old middle class who worked hard, saved and invested, I think are going to be much wealthier in their retirements than the current middle classes because they got to keep more of their wealth (which then did grow as you state through compound interest effect). 7) Another thing with “the wealth distribution problem” I dont get is summed up by the following: For decades the Chinese were poor with very flat (though still very skewed) wealth distribution. Now, they are much wealthier across the country but there is a greatly heightened wealth pyramid. I suspect the Chinese would rather be wealthier, with a more pointed distribution, than poorer without. 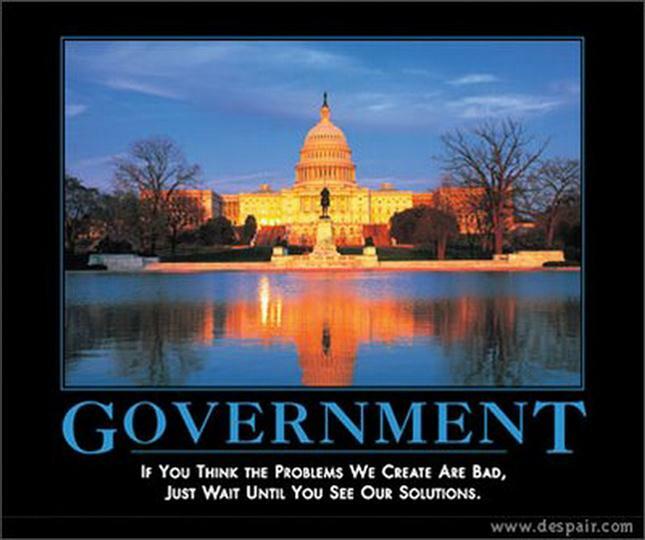 I think a much bigger problem than lack of resources and over consumption is governmental interference. It’s amazing how easily measures, even with genuine intentions, to make “the population richer, and evenly distribute the wealth” can turn countries into total basket cases. I suspect that Western countries have managed to avoid extreme inflation, despite their debt gorging by the fact that most of the money has been ending up in China in exchange for goods, and China has been hoarding the cash – I think they have something like 3 trillion now. Its difficult to speculate what would happen if that money started making its way back into Europe/USA ? All this is only opinion though. Unlike climate science debates, it’s pretty hard to figure out even simple absolute truths. Thanks for taking the time to compose such a detailed response. It is much appreciated. 2) I agree completely with you on the issue of government and even wrote some opinion pieces on that. But I do maintain that consumer spending and private consumer debt is out of control as well. People borrow and spend far too much and the result is that individuals have zero financial resilience. Since so many people live from paycheck to paycheck, a job loss immediately drives them to bankruptcy. And since people have such tremendous debt (primarily mortgages), a rise in interest rates back to normal levels will also drive many people to bankruptcy and create large deleveraging problems. I also do not think that the large service sector (facilitating consumption) and the large public sector (using government money to give people more spending power in return for not-very-useful services) in many developed countries is sustainable. 3) Yep, I think the world is slowly learning that Keynes was wrong and Austrian economics is a much more sustainable model – less fun in the short term, but much more sustainable in the long term. 5) I have no problem with the rich people on the top of the pyramid (as long as they make their wealth by making real contributions to society and not from receiving special privileges from government or unethical debt leveraging). Bill Gates made great contributions to the world and deserves every cent he made. The Fat Cats on Wall Street are another matter though. The purpose of the pyramid in this post is primarily to illustrate the massive poverty class on planet Earth and to highlight the problems these billions of poor people can create when environmental constraints and demographic shifts cause our inflationary debt-based economic model to fail (as I think it is already doing). We are seeing some precursors of this in Southern European states at the moment and the large food price hikes caused by the massive US drought currently going on is likely to provide us with a few more examples in the near future. 6) The problem I tried to address in this point is just that the majority of people simply do not invest and therefore never reap the rewards of compound interest. I think this is primarily due to the blind reliance on government to provide for retirement (which I fear will cause massive problems in the future) and the widespread misconception that a home is an investment. The select few who control the wealth can use this wealth to gain more wealth through compounding and even leverage it up to make even more money (and get bailed out by government when they make a bad bet). 7) This is the classic capitalism vs socialism/communism debate. When China freed their markets, wealth began flowing in like crazy, but of course got concentrated in the hands of those who took the business initiative (which I think is fair and good). This is good as long as things are going well and the increased wealth is also making the poor better off. However, when things go pear-shaped (like they are doing now) the poor are the first to suffer and this can lead to very serious socio-economic consequences. This is the risk brought by excessively large inequality. I agree with you on the problem with government interference and I am very much against socialism, welfare states and government intervention into the free market. Such a system brings suffocating government bureaucracy, encourages mediocrity and destroys personal liberty and personal responsibility – all of which are very serious problems. Government bailouts and interest rate manipulations also greatly distort the markets and basically just break all the rules which maintain order and discipline. Like you said – this can quickly result in a basket-case scenario. Thanks for taking the time to go through this work and make such a detailed response. I will definitely make a few adjustments to these posts based on this discussion. What I am essentially trying to do with this blog is to accurately pinpoint the most pressing problems facing the sustainability of our global civilization and come up with the optimal set of individual lifestyle choices in this environment. Ultimately, this will then give anyone who is interested the information necessary to “save our world by building a happy, healthy and wealthy life”. Critical evaluations by people such as yourself are essential towards improving this work and for that I thank you.